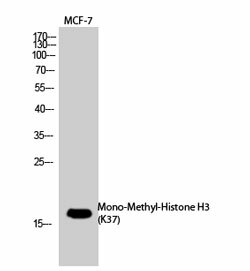 Western Blot analysis of MCF-7 cells using Mono-Methyl-Histone H3 (K37) Polyclonal Antibody. Histone H3K37me1 (H3K37 Monomethyl) Polyclonal Antibody. Unconjugated. Raised in: Rabbit. Synthesized peptide derived from human Histone H3 around the mono-methylation site of K37. Shen Y et. al. (February 2019). Set7 Is a H3K37 Methyltransferase in Schizosaccharomyces pombe and Is Required for Proper Gametogenesis. Structure.